Studies explain the differences in twins with supposedly matching genes. How do you explain identical twins that don't look alike? The stereotype of identical twins is that they are exactly the same: they look alike, they dress in matching outfits, they share the same likes and dislikes. Parents of identical twins know differently, however. Despite their shared genetic component, identical multiples are unique individuals. Though they do share similarities, they also have many differences. For example, my own children have always exhibited about a twenty-five percent difference in their weight. When they were newborns, weighing four and five pounds, it was quite obvious. At other times as they've grown up, it's not noticeable. We have confirmed that they are indeed identical twins, yet people are often skeptical because they don't "look" alike. They don't act like either. One likes to dance; the other likes to play basketball. Certainly, we encourage them to pursue their individual interests, but the initial inclination towards these activities was all their own. Identical, or monozygotic, twins develop from a single egg/sperm combination that splits a few days after conception. Their DNA originates from a single source, thus their genetic makeup is the same and the characteristics that are determined by genetics will be similar. Monozygotic twins are always of the same gender, except in extremely rare cases of chromosomal defect. On the other hand, fraternal, or dizygotic, multiples form when two separate eggs are fertilized by separate sperm in a single ovulation cycle. They are no more alike than any sibling set, sharing about 50% of their genetic markers in a unique combination of genes from both parents. While identical twins form with the same set of genes, human development is not just genetic. The environment also has an impact. So, beginning in the early environment of the womb, external influences can change the appearance of twins. For example, some monozygotic twins share a placenta. One twin may have a more advantageous connection to the placenta, receiving the first run of nutrients. This situation can cause a size discrepancy between the babies, a physical difference that continues as they grow up. Twin-to-Twin Transfusion Syndrome (TTTS) is another condition that affects twins in the womb and can impact their development. 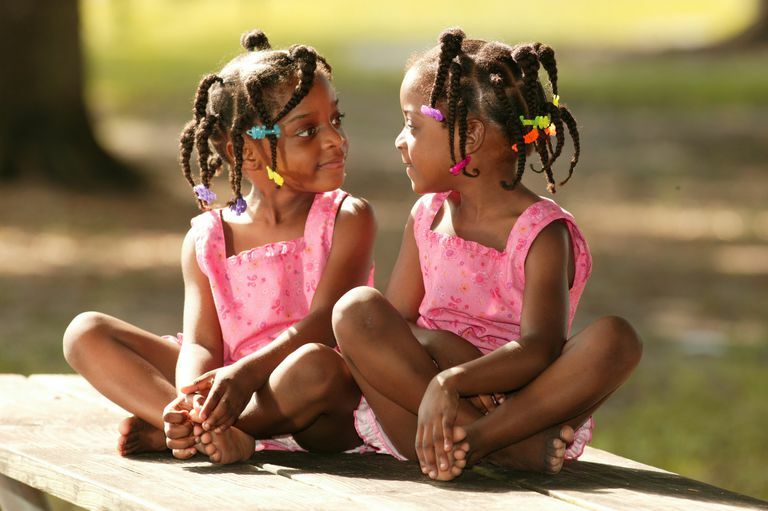 While most twins grow up in the same home environment, there are many circumstances that create differences in the children's appearances, personalities, and interests. As the twins approach the teen years, they may even seek to establish dissimilar qualities in order to establish individual identities. Scientists have offered a new explanation for the differences between identical twins. Epigenome refers to natural chemical modifications within a person's genome (genetic material). As an article in the New York Times explains, they "act on a gene like a gas pedal or a brake, marking it for higher or lower activity." A study conducted by a team of researchers at the Spanish National Cancer Center in Madrid concluded that, while identical twins are born with the same epigenome, their epigenetic profiles begin to diverge as they age. The differences increase as twins live longer and spend more time apart. The scientists offered two theories to explain this phenomenon. First, that epigenetic marks are removed randomly as people age. Secondly, environmental influences change the pattern of epigenetic marks. In a Washington Post article Dr. Manel Esteller, one of the lead researchers, said that "small epigenetic events before birth probably account for many of the minor distinguishing differences in the appearance, personality and general health of young twins." The research is significant because changes in the epigenome may be responsible for the development of diseases, like cancer. It's hoped that further study of the epigenome in identical twins will help researchers pinpoint factors that contribute to cancer. A study published in the March 2008 issue of The American Journal of Human Genetics offers further explanation, even challenging the accepted notion that identical twins have identical genetic profiles. The research found changes in the DNA sequence between identical twins, reflected in Copy Number Variations (when a gene exists in multiple copies). The research did not confirm whether these changes occur during fetal development or as twins age. The research is significant because many medical conditions can be influenced by copy number variations, such as autism, AIDS, and lupus. Bruder, C., et al. "Phenotypically Concordant and Discordant Monozygotic Twins Display Different DNA Copy-Number-Variation Profiles." American Journal of Human Genetics, March 3, 2008, p. 763. Fraga, M., et al. "Epigenetic differences arise during the lifetime of monozygotic twins." Proceedings of the National Academy of Sciences, July 2005, p. 10604.